You will see part of the Ngarkat Conservation Park as you travel along the sealed Pinnaroo - Bordertown Road. Pertendi Hut is located on the eastern side of this road and is accessible by 2WD. This historic hut was restored by the Friends of Southern Mallee Parks in 1997. A short walking trail introduces you to the surrounding mallee (see Pertendi Hike). After the walk, enjoy a barbecue or picnic under the shady trees. Camping is also an option for those with a little more time. You will see more of the park as you drive along the highway towards either Pinnaroo or Bordertown. The gravel Rosy Pine Road heads south from the Mallee Highway just 6 km south-west of Pinnaroo. The entrance to Ngarkat Conservation Park is 15 km down the Rosy Pine Road. Just inside the entrance is Pine Hut Soak. There is 2WD access to the car park. You can make use of the shady picnic facilities and explore the network of walking trails that start opposite the campground. You can enjoy a short one hour walk to the historic Nanam Well, or for those with lots of energy, try the 17 km return hike to Scorpion Springs. Travel north-west from Pinnaroo and visit Karte Conservation Park. Two-wheel drive access exists into the picnic and camping areas of the park. A short but challenging hike gives great views of the district. From Pinnaroo, travel down Rosy Pine Road to Pine Hut Soak. A short drive from here will take you to the Fishponds, Scorpion Springs and back to the Centre Track via Nanam Well. A 5 minute walk along paths at Nanam Well and Fishponds are good opportunities to stretch your legs. Follow the Centre Track in a southerly and then westerly direction until you reach Pertendi Hut. Here you can use the picnic facilities, toilets or camp sites. The 2 km walk is very popular. From here follow the bitumen road north to Pinnaroo or Lameroo. Alternatively, driving south will take you to Bordertown. South of Lameroo is Baan (pronounced Bain) Hill - a great area for a picnic, with tables and a toilet available. Further south in Ngarkat Conservation Park is Box Flat. This shady, natural soak is popular for camping and picnics. A 5 minute walk takes you to the Box Flat outstation ruins. For those Mount Rescue Loop with limited time, you can double back towards Lameroo. If you have all day to spend you may wish to travel further south down Baan Hill Road and explore the sights around Mount Rescue. Just remember to leave yourself enough time to return, or alternatively, travel home via Tintinara. Starting from Tintinara, travel south-east along the Dukes Highway for 22 km. Turn north onto Snoswells Road and follow this until you reach the park. Your first stop is at Tyms Lookout. From here travel to Bucks Camp ruins (camping area) and head north towards the Rescue Track. Drive east along Rescue Track to Mount Rescue. A short hike will give you magnificent views of the mallee from the top of Mount Rescue. When you reach Baan Hill Track turn right and travel until you reach the park’s southern boundary. Here a right hand turn will take you along the South Boundary Track to the Snoswells Road corner and back to Tintinara. From Pinnaroo, head to Pine Hut Soak, taking time to see Nanam Well and Scorpion Springs. Drive south down the Centre Track, and then onto the Border Track. Travel south beyond Red Bluff Track to the track heading east to Red Bluff itself. Camp for the night below the shadow of this impressive natural monument. Remember that you are now in Victoria so you will need to contact Parks Victoria regarding park permits and regulations. In the morning, leave Red Bluff and travel east along the Red Bluff Track until you reach the Murrayville - Nhill Road. Turn left and travel north to Murrayville via Big Billy. Return to Pinnaroo via the sealed Mallee Highway. Remember the last time you were in a park, looking for a camping area with shelter, shade and privacy? You found a spot and then wondered whether you were allowed to camp there. Camping is only permitted in designated camping areas. Camping areas are located in both Ngarkat Conservation Park and Karte Conservation Park. Camp sites are clearly marked with designated tracks into them. Caravan parks and facilities are available in nearby towns. Check the chart below to see what facilities are available at each campground. Entry and camping permits are required in Ngarkat Conservation Park. Permits are available from the DEH office in Lameroo or any of the outlets listed below. Fees collected are used for conservation and to maintain and improve park facilities for your ongoing enjoyment. 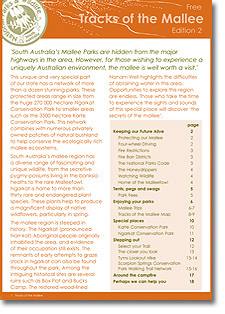 South Australia’s Mallee Parks are hidden from the major highways in the area. However, for those wishing to experience a uniquely Australian environment, the mallee is well worth a visit. This unique and very special part of our state has a network of more than a dozen stunning parks. These protected areas range in size from the huge 270 000 hectare Ngarkat Conservation Park to smaller areas such as the 3500 hectare Karte Conservation Park. This network combines with numerous privately owned patches of natural bushland to help conserve the ecologically rich mallee ecosystems. South Australia’s mallee region has a diverse range of fascinating and unique wildlife, from the secretive pygmy-possums living in the banksia heaths to the rare Malleefowl. Ngarkat is home to more than thirty rare and endangered plant species. These plants help to produce a magnificent display of native wildflowers, particularly in spring. The mallee region is steeped in history. The Ngarkat (pronounced Narr-kat) Aboriginal people originally inhabited the area, and evidence of their occupation still exists. The remnants of early attempts to graze stock in Ngarkat can also be found throughout the park. Among the intriguing historical sites are several ruins such as Box Flat and Bucks Camp. The restored wood-lined Nanam Well highlights the difficulties of obtaining water in this area. Opportunities to explore this region are endless. Those who take the time to experience the sights and sounds of this special place will discover ‘the secrets of the mallee’.